What’s life like in an elite Russian Defense Ministry school for girls? To apply, however, you must be the daughter of a Russian soldier, and even then, only one out of 20 applicants will be accepted. Can your boarding school be described as an elite educational establishment? "If you have in mind that our girls don't drink, don't smoke and don't swear - then yes. But, in general, we regard good manners as the norm. We are a normal 'Soviet' school." The boarding school's press officer who accompanies us has a fairly rare name by today's standards - Taisya. In fact, the name was common among teachers in Soviet schools. Our Taisya is simultaneously welcoming yet stern. Everything here is like that: aesthetics and discipline coexist and complement each other. Taisya pronounces the words "normal Soviet school" with a barely concealed nostalgia. This "normal Soviet school" is situated in impressive grounds three miles northwest of the Kremlin. Were it not for a high brick wall, the security gates and a ban on leaving school grounds unaccompanied by an adult, it'd be a classic campus (which, by the way, was not a typical school premises in the Soviet period). There's a new classroom facility, several dorms, a music center, athletic facilities, a large indoor equestrian arena, a swimming pool and a splendid English-style park. This is a real sanctuary in the middle of a metropolis of 12 million people. This Defense Ministry's boarding school for girls has the status of a cadet corps, but it seems to continue the traditions of the institutes for girls that existed in Imperial Russia and which were shut after 1917. At any rate, the goal of "giving the state educated women, good mothers and useful members of the family and society" that Catherine the Great set before the 18th century Imperial Society for the Training of Well-Born Girls dovetails with the goals of teachers and educators at this post-Soviet "school for well-bred girls." The childhood backgrounds of the majority of girls are similar: life in a military compound somewhere in this vast country, lessons in the garrison, and uncertain prospects. Then there's an unexpected turn of events: someone happens to see a report on the news, or father, returning from duty one day, who announces at the front door an offer that can't be refused. Katya Filatova, an imposing girl of 16, sees me going up to the window and trying in vain to get a mobile phone signal. She gets out her smartphone. "Do you need Wi-Fi? You can use mine." Katya is in tenth grade. Another year and she's a free. "I'm going to study journalism." Katya looks me up and down perfunctorily as if trying to convince herself once again that she's made the right choice. Tenth grade at the boarding school is when choices about further education begin to be pondered. We're standing in the corridor, on the first floor of the classroom facility, next to an enormous portrait of Emperor Alexander II. "A little autocratic for a 'Soviet' school," I quip, turning in Taisya's direction. She stares at me disapprovingly. "These are the science rooms - biology, physics and chemistry," Katya says, coming to Taisya's rescue. "Girls who study humanities like me are on the second floor." Katya was born in the Kola Peninsula - in Olenegorsk, a small town in the Arctic Circle about 1,100 miles north of Moscow. Apart from a military unit, it has a mining and industrial complex for the extraction and processing of iron ore. Career prospects for young people in the North are limited. In 2014, Olenegorsk was put on a government list of so-called "monotowns," where people's lives are completely dependent on the fortunes of a single enterprise and, in the words of a government edict, "there are risks of a deterioration of the socio-economic situation." The news that a Defense Ministry boarding school for girls had opened in Moscow came as a stroke of luck for Katya. The boarding school admits girls, aged 10-11, who have finished primary school, and their place is fully funded by the state. There's very stiff competition for places, and Taisya refuses to say how many girls apply each year (the numbers are not made public), but when I mention I've heard from the girls that 20 applicants compete for each place she nods her head in agreement. 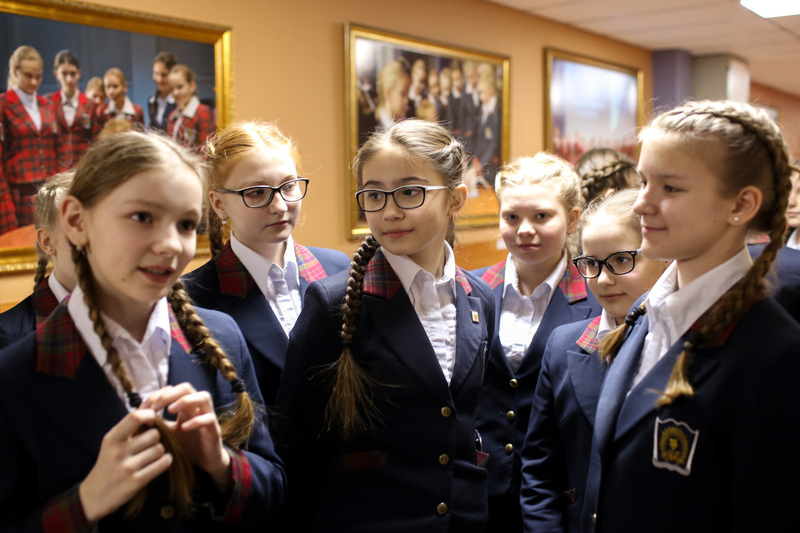 Formally, the girls continue to study in fifth grade according to the secondary school curriculum, but in practice they find themselves following the syllabus of a specialized school, as it was known in the Soviet period. The difference is that there's "in-depth" teaching not just of one subject - languages or math (or physics or biology), but of all subjects simultaneously until tenth grade, when a choice about specialization can be made. Every day for seven years, with breaks for holidays, the girls are fully occupied. The day begins at 7 a.m. with group exercises. After lessons, which include two foreign languages, piano, swimming and figure skating, there are optional courses: a third foreign language, music, painting, sculpture, choreography (Irish dancing is particularly popular), rehearsals in the drama studio, the robotics club, or filming for the school's TV channel. And of course sport - lots of sports. In the corridors you can bump into the European sumo wrestling youth champion Nastya Nikitina. It's the same in the riding arena, where you can come across the winner of the Russian National School Physics Olympiad. Sometimes they are one and the same person. The girls return "home" to their double rooms in the dorm by 8 p.m. Before sleep, they have 30 minutes of "private time." Once a month, the girls are allowed to go into town accompanied by relatives or an authorized chaperone. Every three months a Birthday Celebration Day is held to fete those girls whose birthdays fell in the relevant period. The disco is a much awaited treat, especially because it's a rare occasion when the girls have boy visitors - from the Cadet Corpus, Army Music Academy, and Emergencies Ministry Academy. "It's the only day we can allow ourselves a manicure," says Katya Filatova. Girls in grades 5-9 have even fewer "civilian" privileges. While seniors are allowed to have a mobile phone all the time, juniors are only given their devices for an hour each evening. The hour is fully devoted to phone calls with parents. "Have you seen our cockerel yet?" It's not so much a question as a demand for an answer from a charming young girl with large grey eyes and braided pigtails. "It was hatched by our girls in biology." "What do you mean 'hatched'?" "Quite simple - from an egg." Stasya Starozhuk is in sixth grade. Her mother is in the army - she is a specialist in a radio battalion in the North Caucasus town of Nevinomyssk, 900 miles south of the Russian capital. The girl joined the school a year and a half ago. Stasya and several of her peers put on identical light blue padded jackets and take us on a trip around the school grounds. Somewhere deep in the English park lives the cockerel hatched in the biology lesson. Taisya goes with us, naturally, to keep an eye on the girls and the visitors. We understand perfectly: the Defense Ministry must protect its military secrets.